A Year of Being Here: Rosemerry Wahtola Trommer: "Before We Can Unlearn"
Rosemerry Wahtola Trommer: "Before We Can Unlearn"
the red Frisbee, the sweet blackberry, the small pink ball. lilac bush. Already the world slips from its chain of syllables. a rock and says, This. And I say, Rock. Gray rock. interferes, so material, so fleshsome, so brute in its hungers. whatever we think we know: Tree. Rock. 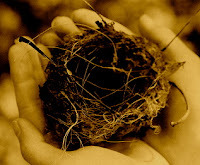 Nest. "Before We Can Unlearn" by Rosemerry Wahtola Trommer. Posted by Rosemerry Wahtola Trommer on Virtual Teahouse, 4/9/2010.